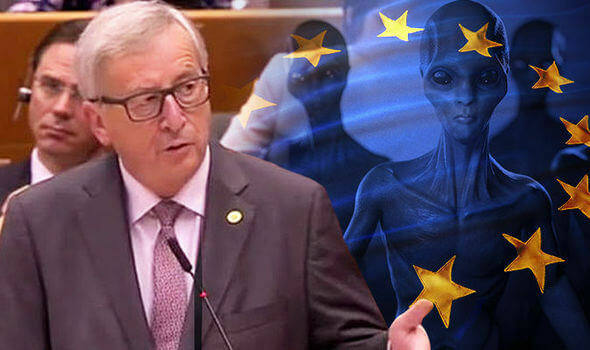 ALIEN conspiracy theorists were sent into overdrive after European Commission president Jean Claude Juncker appeared to say he had “heard from the leaders of other planets”. Clips of the EU big wig speaking in a Brexit debate are going viral online, after he was heard to say aliens were worried about the looming Brexit by the UK from the union. He said, translated from French: “You need to know that those who observe us from afar are worried. “I have have seen, listened and heard many leaders of other planets and they are very worried because they wonder about the course the EU will follow. It was apparently nothing more than a slip of the tongue, as even some alien conspiracy websites have pointed out. Mr Juncker meant to say “many leaders of our planet” rather than “leaders of other planets” it is claimed. But it hasn’t stopped other websites, saying it was a coded message to the world that aliens exist. One reader posted on Sott.net: “Conjuring up a fake Alien Invasion to hasten the new world order has been in the works for some time. But others rushed to his defence. One posted on YouTube: “So he mixed up the words. Big deal. Try speaking four languages without making a mistake, especially bearing so much responsibility. “Conjuring up a fake Alien Invasion to hasten the new world order has been in the works for some time.